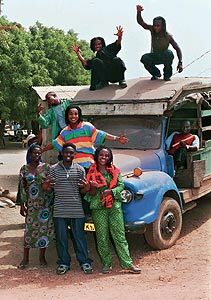 The members of the group Adesa belong the Ga people, a minority living in the surroundings of the Ghanaian capital Accra. Traditionally the Ga are fishermen and sailors. For over 500 years the small Ga tribe had a varied history. Their main occupation as coastal merchants of gold, palm oil and other brought wealth to them as well as the opportunity to come into close contact with different cultures. After the colonial powers occupied their territories with military force slavery was established and most of the Ga were deported as slaves. Thus the Ga's collective memory of their history and cultural traditions was erased for ever. But their legendary pride survived and gave them sufficient strength to become again the most active and open minded traders in the capital and in other Ghanaian ports. Due to this history the music traditions in this part of West Africa differs very much from those in Senegal or Mali where despite colonialism famous artists' clans have kept alive the knowledge of ritual instruments, melodies and rhythms performed in ceremonies and of poetry for several hundred years. More than 15 years ago it was in Accra's famous market place Kaneshei - the scenery of the song "Pamplo" - that Adesa's artistic works and search for their identity started: Korkoi Odametey from the royal family of the Ga Mantse, a female dancer and active member of the Tigari cult, met Nii Ayi Conen from Germany. On his way to find the meaning of life he had already spent some years in different schools of master drummers in Ghana. Korkoi Odametey and Nii Ayi Conen decided not only to marry but as well to plunge into the biggest adventure of their life: the formation of the ensemble "Adesa" (mankind). Adesa's starting point is the ritual and courtly music of the Ga, which they want to keep up and to develop by inserting influences from other cultures. Thus they contribute to its permanent renewal to prevent the source of the inexhaustible richness of their culture and happiness from running dry. But this was not a straight road. At the beginning Adesa experimented with popular Ghanaian music styles like highlife and reggae and the use of western instruments like keyboard and electric guitar. They created original, funny shows for children with nearly forgotten elements like acrobatics, storytelling and traditional music. The Odametey family has arranged their life between the two continents Africa and Europe: In Europe they got settled in Kevelaer a German place of pilgrimage in the Lower Rhine area. It is from here they start for their long tours throughout the European countries. But during the long and cold European winter Adesa returns to their Ghanaian domiciles "Noko Ye Dzen" and "Blafonio House" in Accra. The painful lost due to the sudden death two members of the band urged the group to support the Tigari cult and to continue their search for the good spirit especially through their artistic works. And by now the second generation of the clan has lined up to let blow the fresh wind of the youth : Having developed the same artistic complexity as his parents and other experienced musicians of the group Julius Nartey, the eldest son of Korkoi Odametey and Nii Ayi Conen gives new impulses to the repertory.